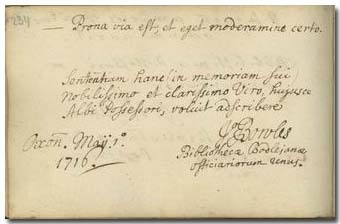 Pápai Páriz Ferenc, Album amicorum p. 234. In Oxford, on May 1, 1716. About J. Bowles we know only as much as he himself wrote in the album of Pápai Páriz. On the same day wrote in the album in Oxford the prefect of the Bodleian Library John Hudson, and Samuel Parker (pp. 233, 236), and one day earlier Edmond Halley (p. 237).